The national Five A Side Final of the corporate football events comes to a climax in Edinburgh next Wednesday. To date the Summer season of Business Fives has been a roaring success for the companies involved and indeed charities across Scotland. £18,098 has already been raised ahead of the final of the national business 5 aside tournament. The £18,000 brings the charity impact of the socially conscious business over the £60,000 mark through both its’s football and golf events since launching in 2016. The tournament, now in its fifth season, has been supported by Insider.co.uk, Edinburgh, Aberdeen, Glasgow and Dundee Chamber of Commerce as well as strategic industry partners like ScotlandIS and Scottish Property Federation. Of the 100 companies that took part 23 companies will make up the line-up for the National final taking place in Edinburgh with companies such as Scottish Water, Grant Thornton, Freeagent, Standard Life, Edrington to name just a few involved. 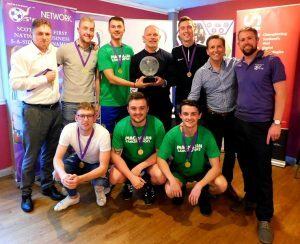 Companies from across the country have been raising money for their chosen charity in a model that has enabled Business Fives to make a significant positive impact on charities throughout Scotland, which was recognised recently at the Causeway awards as the firm picked up the Sustainability and Social Impact Award. The tournament has been supported by a host of ambassadors from the football world such as Hearts & Celtic legend Tosh McKinlay, former SFA Chief Executive and Rangers icon Gordon Smith, Dundee and Celtic shotstopper, Rab Douglas, Aberdeen and Scotland star Jim Leighton, former Hibernian and Inverness manager John Yogi Hughes, former SFA and international Referee, James Bee and TV presenter, David Tanner. Iomart who qualified from the professional services heat in Glasgow raised £1000 for Juvenile Diabetes Research Foundation with the fundraising efforts continuing ahead of the Five A Side Final. Edinrgton raised £600 for their chosen charity Robertson Trust while Advance Construction and Nucleus Financial both raised £500 for their chosen causes Ring20 Research Foundation and the Yard respectively. Investment company, Standard Life who qualified by winning the Edinburgh Professional services industry heat look to be in great form ahead of the final as they raised £150 for Marie Curie who they will go on to play for in the finals and go one better than their semi final appearance at last summer’s overall final. Teams also returning to the Five A Side Final finals include Standard Life, AutoRek, ENGIE and DJ Alexander while others like Nucleus Financial, Expro, Kilmac, Advance Construction, Kindgom HA, SP Technology, Cathcart Associates, Intona, Zonal, EnerMech all make their debut in the national event having qualified from events in Glasgow, Dundee, Edinburgh and Aberdeen. The final promises to be an exciting and competitive encounter with the standards of the qualifying companies fittingly high. The full line up for the final and their benefiting charities is below.